This week instead of our usual one guest for Follower Friday, we have two! The lovely Megan from City Stitches and Bianca from Sweet Diesel Designs. The reason for two followers this week is that these ladies are collaborating to host a QAL that starts in April. 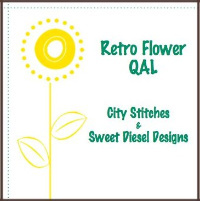 They're calling it the Retro Flowers QAL. What's a QAL without some giveaways?? There will be 2 giveaways each featuring a Jelly Roll of your choice! Both Bianca and Megan will be giving away one of these randomly at the end of April. Grand Prizes: To be eligible for one of the grand prizes, you must submit your finished quilt through the linky party by June 1. Here's the breakdown..
One grand prize will be awarded by Christina (the pattern designer) to the quilt which most exemplifies her vision of the pattern (color, quilting, final product, act). Two grand prizes will be given out for best (and most modern) use of color and fabric. These will be judged by Rachel of Stitched in Color, Nova of A Cuppa and A Catch Up, Bianca of Sweet Diesel Designs, and myself. I'm off to choose my fabrics and get things ready! I just found out a bit of news surrounding the Pinterest issues and copyright on pictures that I thought I might share. Flickr recently started allowing their members the option of "no-pin"
Which means people will not be allowed to pin your flickr pictures, they'll have to go to the original source/bog post, etc. The 2nd one down that says "allow others to share your stuff"
make sure that says "no"
but other people will not be able to. Update - The fabulous Hadley brought it to my attention that this may prohibit you from being allowed to use pictures in mosaics and adding as favorites -- then she tested it, happy to report its not the case. Even if you "no-pin" you will still be able to use the pictures in mosaics and as favorites! I've found that you can still pin from a persons photo stream, but not the specific picture. If you want more information about this "no-pin" option I found some information here, here and here. I personally don't mind people pinning my things, but I'd prefer they did it from the specific blog post and link it back to me, which is why I decided to turn off the pinning on flickr. No post is complete without a bit of loveliness..
Maybe i'll actually have some sewing to show soon? Sooo, you may or may not have noticed but Knotted-Thread is officially a dot com! Boyfriend and I went to DC this weekend to visit some friends and one just so happens to be a computer whiz, so he got me all set up! but you may want to update your reader/bloglovin/etc. It was unreal to be walking around in flip-flops in March! I did manage to get some sewing done last night..
We're back with a new follower! Place: Relaxing by a lake. We took a family vacation to Lewis & Clark Lake in Yankton, SD last summer--I'd love to go back. Fabric line: pretty much anything by Moda and Riley Blake--right now I want some Half Moon Modern by Moda--love those scissors prints! Project completed by you: I have lots of favorite projects but the one I'm most proud of is the baby blanket I made for a friend's baby girl 10 years ago. It started my love of quilting. At the time, I had no idea what I was doing. It was before you could google something on the internet. I used horrible polyester batting because I didn't know any better. I hand-tied it because I had no clue how to machine quilt. I didn't know how to bind it so I used some kind of ruffle trim that I didn't even attach correctly. I was still so proud of it. As the years passed and I learned more about quilting, I was kind of embarrassed by my gift. I delivered another baby quilt last year to this same friend to celebrate the birth of her third child. Her 10-year-old daughter still had her blanket which she kept in her memory box. She brought it out to show me and it looked much better than I remembered. I don't have a picture of that quilt, so I'll share my second favorite project, too. It's my version of a $198 Anthropologie bag I made for a knock-off challenge. It was my first attempt at piecing something other than squares (don't look too close--many of the points don't match up) and I was really happy with how it turned out. I use it as my library bag and get a lot of compliments on it. Fabric line: I like pretty much anything but Karavan by Free Spirit Fabrics is one I've seen recently that I don't really care for. Project completed by you: A quilt intended as a Christmas gift for my mother-in-law that is still sitting in my craft room unfinished. It started off with so much promise. I used a Moda Fresh Flowers charm pack to make a pretty disappearing nine patch panel. Instead of just using this small panel for a baby quilt I decided to try and turn it into a larger quilt. Instead of buying another charm pack to make the panel larger I decided to add odd borders and a weirdly-pieced backing. Instead of using straight-line quilting which I'm able to do, I decided to give free-motion quilting a whirl. (Don't they warn to you practice on a small project first?) The result is a project I have no desire to finish yet have too much time and money invested so I really need to finish it. And I'm sure my mother-in-law would love it but right now all I can see are the imperfections. OK--maybe it's not that bad? Maybe I just needed a break from it. Make my first I-spy quilt using the charms from my first fabric swap. 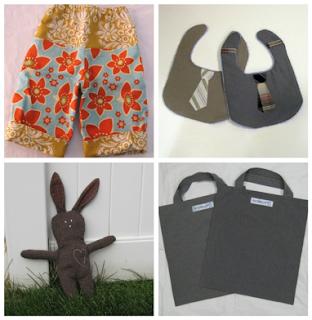 Participate in more fabric swaps and host at least one more swap--they're so much fun! 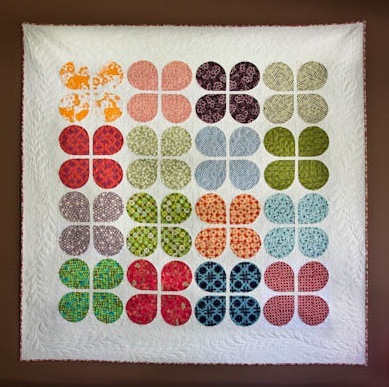 Try a new quilting technique and use up my scraps--string quilt blocks are first on the list. Give my family mostly handmade gifts for birthdays/Christmas. 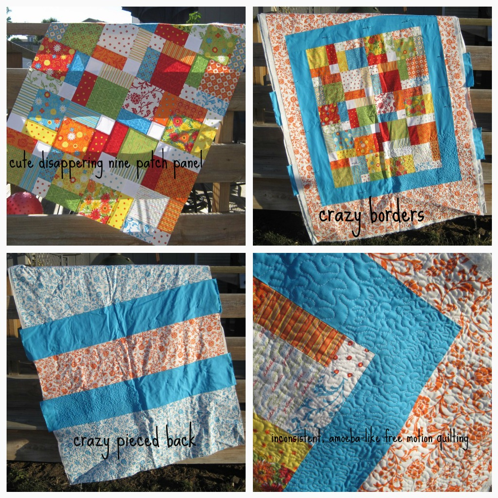 Personally, I think the quilt is very pretty, great colors! Thank you again for taking time out of your life to be a featured follower today! Then I also completed the remaining 3 blocks in the SewHappyGeek QAL! My 1st attempt at paper piecing!! As most of you have seen, there is a new block sweeping the blogging world.. I of course, had to take part.